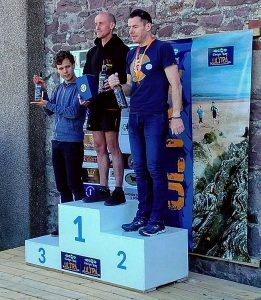 Dunoon Hill Runners club member, Michael Tweedley, has won the Kintyre Way Ultramarathon in a blistering time of 4:52:17. Conditions were sunny and warm for the race, held on 6 May, which covers a distance of 35.5 miles from Tayinloan to Campbeltown. Michael is no stranger to local podiums, having won the inaugural Dunoon 55K Ultramarathon last year. The Kintyre route was also successfully completed by fellow club runners, Elaine Graham and Michelle Cameron. Presenter Dougie Vipond was filming for the BBC’s Adventure Show and took the opportunity to meet the Dunoon Hill Runners, interviewing Michael at the finish. The 2017 race season has well and truly commenced for the club, which has been represented at several other prestigious events across the country. This included the 53 mile Highland Fling Ultramarathon through Loch Lomond and the Trossachs National Park, held on 29 April. The five individual club runners who completed this formidable race were returnees Ian Marshall, Ricky Reid and Lisa Marshall, all of whom set personal bests, as well as first timers, Richie Longster and Sabrina Collins Brolly. 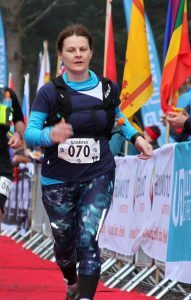 This was Sabrina’s longest ever distance, having completed her first ultra last October, the Dunoon 55K Ultramarathon. In addition, the female relay team, consisting of Angela Wilson, Lucie Shaw, Sara Cudahy and Kat Ullrich, performed very well, reaching the end in an excellent time. That same weekend, Annie Lloyd Evans completed the Fellsman for her fourth time. This consists of a high level traverse covering more than 60 miles over very hard rugged moorland in the Yorkshire Dales. The route has a total elevation gain of over 11,000 feet and requires good navigational skills. Nearer to home, Morven Walsh and Jean Maclennan finished strongly in the 31 mile Glen Lyon Ultra on 6 May – an achievement made all the more challenging by the warmer temperatures that day. Michael Tweedley, Grant Mackellar and Bryan Fitzpatrick all produced fast results in the short but tough Beinn Dubhh hill race at Luss on 26 April, with Michael coming in seventh. 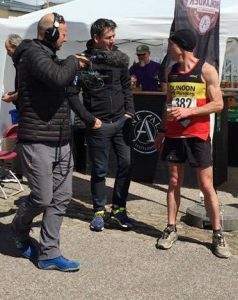 And David Walsh saw success at the Stuc a’Chroin long hill race on 6 May, a gruelling 22 km with 1500 metres of climbing, described as one of the most arduous races in Britain. Bryan Fitzpatrick and David Walsh then went on to set personal bests in the Ben Lomond hill race on 13 May, with Bryan taking over 30 minutes off of his previous time. Race season continues apace and Dunoon Hill Runners will be found running up Goat Fell and Ben Nevis, among many other hills, as well as taking on the 95 mile West Highland Way race in the coming weeks.